Last night, my husband and I got home from a sudden shopping trip to Winco because we were out of just about everything. (My fridge! Empty! Horrors!) The problem with this was that we had planned to make a pot roast for dinner, which takes 4+ hours in the oven. Not good for hungry tummies at dinnertime. Something had to be done. We had purchased a large 4-lb beef chuck roast because it was on sale, sounded good and we could grind the other half of it up for burgers, taco mix and pelmeņi fixin’s. I honestly don’t know why I even bothered buying pre-ground meat from the store after my dad gave me a meat grinder attachment for my Kitchen-aid stand mixer. Grinding your own meat at home produces consistently fluffier, tastier, easier and cheaper ground meat. I love working with it, while the storebought stuff was always somewhat icky to handle and cook. So, since I was grinding meat that night anyway, my husband suggested that we do garlic burgers like the ones at Woody’s Drive-In, a popular “old-style” burger joint in Holladay. I agreed – on the condition that he make homestyle baked french fries and garlic sauce. Combine the beef with the liquid smoke, salt, pepper and Worcestershire or soy sauce. 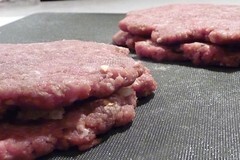 Split in half and flatten into a thin, flat patty. 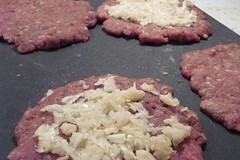 Spread garlic evenly over the surface of one patty, staying a little away from the edges. Place the other patty on top and press the edges in to seal. Cut potatoes into steak fries. Make sure fries have been patted dry if the potatoes were stored in water. In a large bowl, mix together the potatoes with all of the spices, tossing well to ensure even coverage. Drizzle about 2 tsp of oil, tossing to combine. Spread fries evenly on a cookie sheet lined with silicone or foil. Don’t overcrowd. Bake for 30 – 45 minutes, depending on fry thickness, tossing every 10 to 15 minutes. Spray with non-stick spray about halfway through. 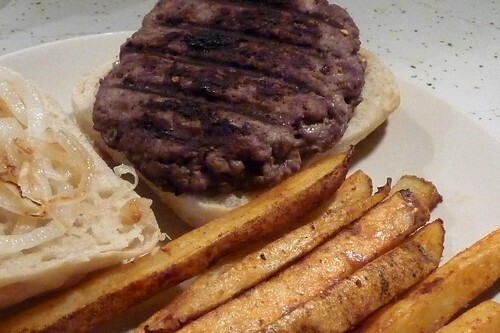 Serve with garlic burgers and garlic sauce for a great garlicky meal! Need a dipping sauce for the fries? Or want to add a bit more garlic to your burger? Spread on some Garlic Sauce! I’ve mentioned before that we love paprikas of all different types. But, if you don’t have anything other than regular paprika, that’s okay too. It will still taste great. This entry was posted in american, dairy-free, gluten-free, recipes, side, untranslated. Bookmark the permalink. I really hate deep-frying because I’m so scared of it and I always screw it up. 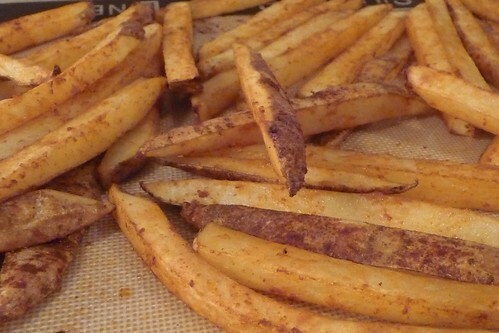 But I’ve found that when done properly, oven-baking results in fries as good as (or possibly better than) fried fries.